On the morning of July 8, 1981, a Bell 47 helicopter with two men aboard was taking off at North Central State Airport in Smithfield when one of the skids struck a runway taxi light. The helicopter flipped over and crashed, coming to rest upside-down. The aircraft’s 21-gallon gas tank was ripped away by the impact and landed a few feet away where it burst into flame. Both men were able to escape without serious injury. 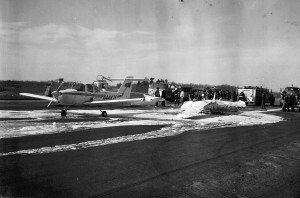 North Central Airport, Smithfield, R. I. 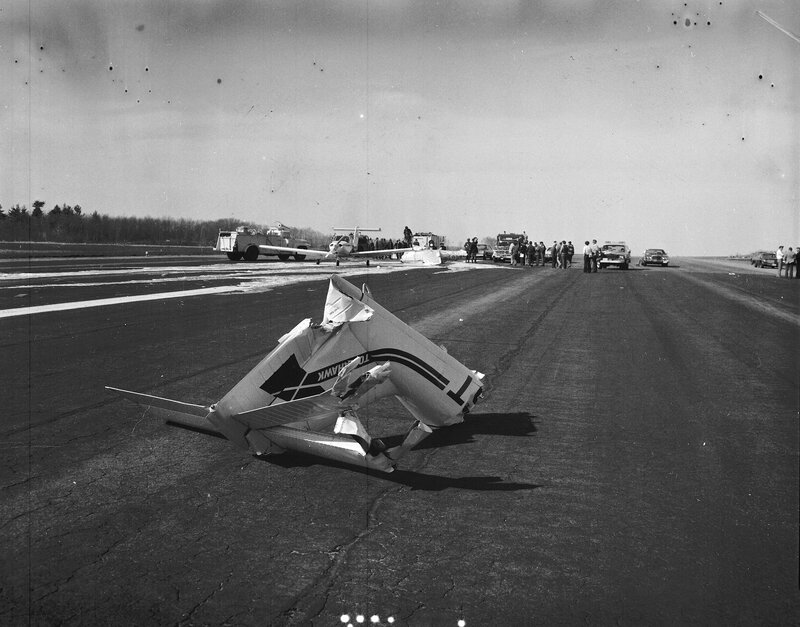 On May 2, 1980, a 59-year-old man was landing his aircraft, a Piper Tomahawk, at North Central State Airport in Smithfield, Rhode Island, while another Piper Tomahawk was sitting on or near the runway with two men inside. The incoming plane clipped the second with its wingtip, flipping it over and tearing off the tail section, completely demolishing the aircraft. Fortunately both men inside were able to climb out on their own and there was no fire. The incoming plane sustained only minor damage. All three men were taken to area hospitals with non-life-threatening injuries. An official from the Department of transportation believed the crash might have been avoided if North Central had a manned control tower – which it does not. 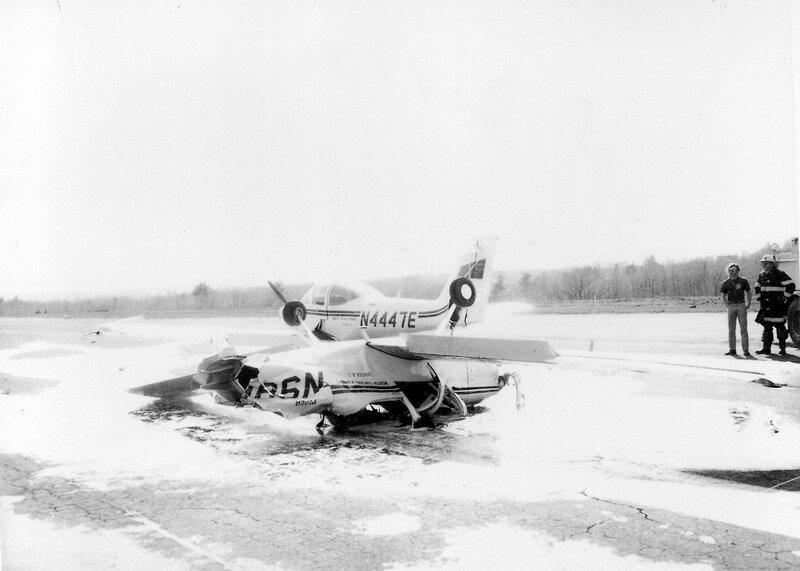 At 12:30 p.m. on April 21, 1986, a Cessna 310 (N128K), left Willow Run Airport in Michigan bound for North Central Airport in Smithfield, R.I., to make a delivery for a company located in North Smithfield. At 3:28 p.m. the pilot took off for his return flight, and according to witnesses, circled the airport area twice before suddenly diving nose-first onto a rocky outcrop about 600 feet from the north-south runway. The plane exploded on impact killing the 23-year-old pilot. 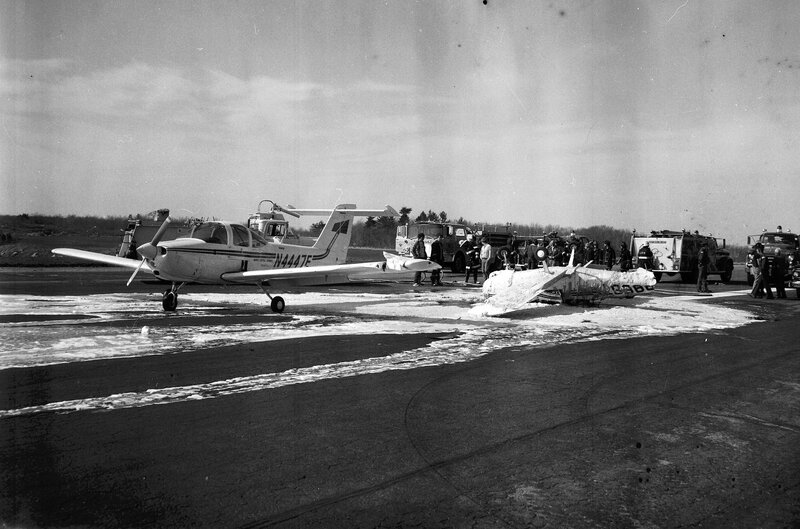 North Central State Airport, located in the northeast corner of Smithfield, Rhode Island, opened in December of 1951. 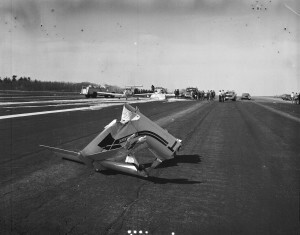 Several months later the first aviation related fatality at the airport occurred there. On July 18, 1952, Clinton Corey, 31, made an emergency landing at North Central Airport after the Piper Cub he was piloting developed engine trouble. The aircraft was owned by E. W. Wiggins Airways of Norwood, Massachusetts, which Corey worked for. He notified the company of the situation, and arrangements were made to leave the plane overnight to be repaired the following day. On the morning of July 19th, Corey returned with William Coullahan, another Wiggins employee, in another Wiggins aircraft. Both men thoroughly went over the aircraft Corey had been flying the day before, and by 3:30 p.m. they deemed it ready for a flight back to Norwood. Coullahan climbed aboard the plane they had been working on, while Corey agreed to fly the other one. Coullahan was to take off first, and then Corey would follow, and both would stay together while en-route back to Norwood. As Coullahan took off, he completed a 200 foot circle at the end of the field before suddenly crashing in a cow pasture just beyond the airport. Coullahan was taken to Roger Williams Hospital in Providence where he died the following day. Coullahan, 29, of Westwood, Mass. was a Marine Corps veteran of World War II where he served in the Pacific Theatre. He was survived by his wife Florence Mae.